Citation Information: J Clin Invest. 2018;128(6):2519-2534. https://doi.org/10.1172/JCI97053. Generation of vPK transgenic mice. 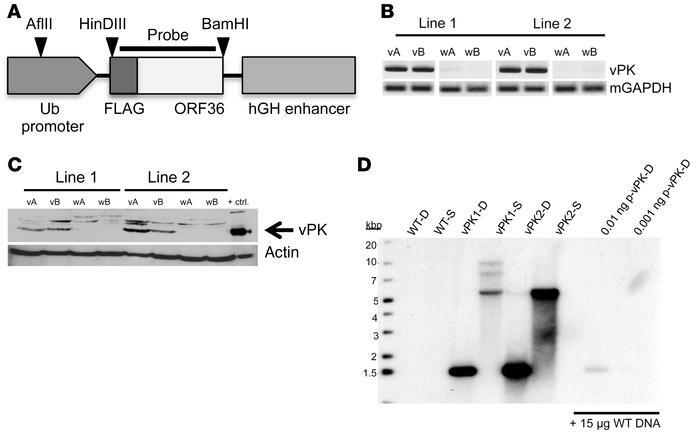 FLAG-tagged vPK was cloned, using HinDIII-HF and BamHI-HF, into a plasmid containing a Ub- and hGH-stabilization element. The linearized transgene fragment was microinjected into the embryos of C57BL/6 mice and implanted into pseudopregnant female mice. Each vPK line was developed from breeding a vPK founder to a C57BL/6 mouse. (A) Schematic of the linearized construct used to generate the vPK transgenic mice, as well as the cut sites and probe for the Southern blot in D. (B) DNA from the tails of 2 WT (wA and wB) and 2 vPK transgenic mice (vA and vB) for lines 1 and 2 was isolated and evaluated by PCR for the vPK transgene. (C) Expression of vPK protein in lysates from spleens of the mice in B as determined by SDS-PAGE and Western blot. Lysate from HEK-293 cells that transiently express vPK was used as a positive control for vPK expression. (D) Southern blot of WT, vPK1, and vPK2. DNA was isolated from the spleens of WT and vPK lines 1 and 2. D, double digest with HinDIII-HF and BamHI-HF; S, single digestion with AFlII; p-vPK, plasmid Ub.vPK.hGH.